Intended to stand for eternity, religious buildings such as churches, mosques and synagogues are typically made of stone. Shinto shrines, on the other hand, are completely fashioned from wood and rebuilt time and time again. “The concept of eternity in Shinto is not everlasting as a physical existence. Worshipping or enshrining a particular kami (deity) at that place and people worshipping for generations and generations is the concept of eternity. So the building itself can be rebuilt,” says Katsuji Iwahashi, chief of the international section of Jinja Honcho (the Association of Shinto Shrines). Even Shinto itself had to be rebuilt in post-World War II Japan. Postwar Shinto was forced to completely separate from the Japanese government under the U.S. Occupation’s Shinto Directive, which led to the creation of private associations such as Jinja Honcho and what is known today as Shrine Shinto. Many foreign observers still view Shinto through the lens of the so-called State Shinto of the Meiji Period (1868-1912). One foreign priestess or kannushi, Pat Ormsby, sees State Shinto as a failed enterprise that continues to cast a shadow over the faith. 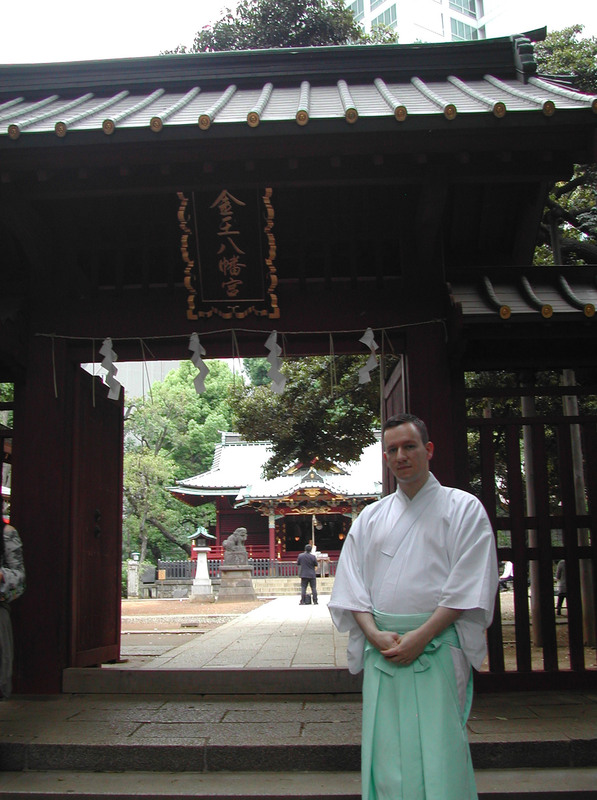 Postwar Shrine Shinto, on the other hand, has shown more of an openness toward other ethnicities, cultures and beliefs — so much so that Florian Wiltschko, a blue-eyed Austrian, became the first foreign Shinto priest certified by Jinja Honcho in 2007. The more accepting nature of Shrine Shinto, Wiltschko says, can be symbolized by the torii gateway located at the entrance of every shrine. While Wiltschko may look like an outsider, Iwahashi stresses that he is just one of more than 20,000 Shinto priests, focused on the rituals of his job rather than issues related to his identity as a non-Japanese in an overwhelmingly Japanese world. Keeping a low profile and working at Konnoh Hachimangu Shrine in Tokyo’s Shibuya district, most Japanese people don’t even know he exists. Other foreign kannushi were trained and certified before Wiltschko, but through non-orthodox shrines in Japan unaffiliated with Jinja Honcho. Ormsby, who has been living in Japan since 1984, is one example. Ormsby first arrived at Kotohiragu Shrine in the town of Kotohira, Kagawa Prefecture, in 1999, where she trained to become a kannushi and was awarded a license in 2001. 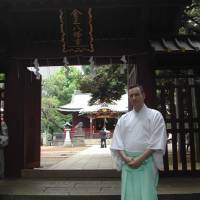 Three other foreign priests who are known to have practiced and trained in Japan are American Koichi Barrish, Dutchman Paul de Leeuw and Australian Caitlin Stronell. None of them are certified through Jinja Honcho like Wiltschko, but they can still perform special rites in shrines throughout Japan, and some have even founded their own shrines abroad. This would have been unthinkable before and during the Meiji Restoration and the prewar period, when Shinto was seen exclusively as a state religion. Wiltschko and Ormsby’s respective paths to priesthood were not easy. They, like every prospective Shinto kannushi, had to go through examinations. These included questions about Japanese history, culture and language — not only the modern language but also ancient Japanese. The foreign apprentices also had to learn how to write Shinto prayers in the language, which would be a challenge even for native Japanese speakers. The difficulties facing a foreign national wishing to become a kannushi don’t start with exams. 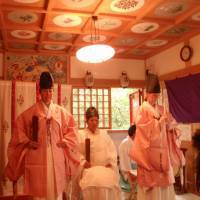 They have much deeper roots in ancient Japanese history and mythology centered around the Emperor. This leads to inevitable questions about whether Shinto assumes an inherent Japanese superiority over other races. Iwahashi believes the question of superiority is best viewed from a historical perspective. When the myth was written, in the eighth-century “Kojiki” (“Records of Ancient Matters”) and “Nihon Shoki” (“The Chronicles of Japan”), the authors were not aware that the world consisted of much more than the islands of Japan. The archipelago was seen as the entire Earth. Iwahashi believes Shinto and Japanese myth is actually much more inclusive. “Maybe the ‘Earth,’ the word written in Japanese myth, includes the whole world,” Iwahashi says when asked about the question of ethnic superiority in Japanese mythology. 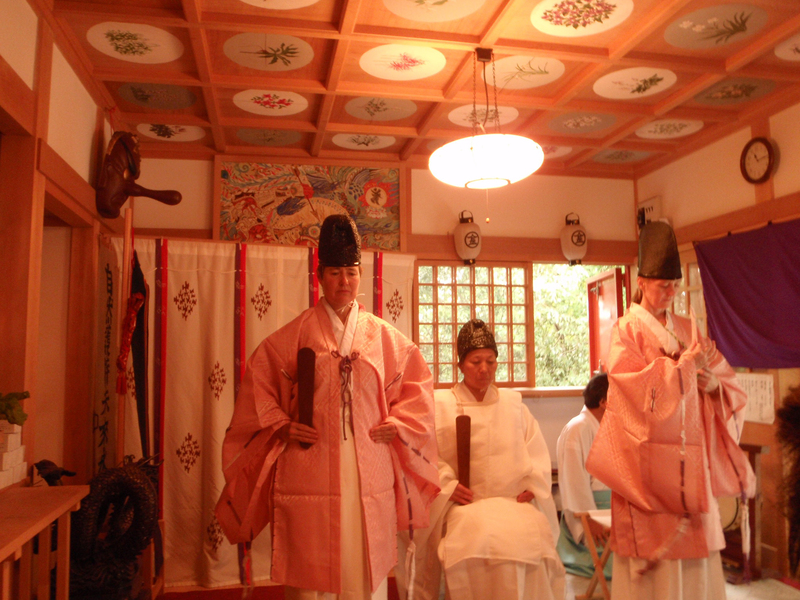 John Dougill, a professor at Ryukoku University in Kyoto and founder of the Green Shinto blog, sees the belief system as more “particularist” than exclusive. This, however, does not mean that Shinto is completely separate from other belief systems — far from it. Nevertheless, the Meiji oligarchy attempted to exploit the differences between native Shinto and imported Buddhism, although Iwahashi agrees with Ormsby that overall, this was a failure. Much of the Japanese population deems itself to be either Buddhist or Shinto, and the two are far from mutually exclusive. A 2012 government survey found that 100 million people considered themselves followers of Shinto, while 85 million were Buddhists. Considering Japan has a population of over 127 million, it doesn’t take a mathematician to deduce that there is a great deal of overlap between the country’s two major religions. The fusion of Buddhism and Shinto (shinbutsu-shūgō) was quite normal in Japan before the Meiji Restoration. The Meiji government aimed to unpick this mesh of faiths, claiming that Buddhism was “impure” and should therefore be separated from Shinto. Ormsby, who was raised a Buddhist in Utah, also believes it is impossible to separate the two religions. Iwahashi says that so-called religion in Japan doesn’t need a particular label, and this may be why some non-Japanese find it attractive. Shinto is not even necessarily viewed as an organized or institutionalized religion in Japan — it is more a part of life. At its core, Shinto is the reverence for ancestors along with the many deities, such as the kami of the mountains or the sea. With a world view anchored in the belief in a spiritual presence within elements of the natural world, it is easy to imagine why environmentalists might see Shinto’s potential value in an age of ecological destruction. Abe has been accused of trying to resurrect the link between politics, nationalist education and Shinto that was dismantled during the U.S. Occupation. In the context of his administration’s bid to amend the 1946 “peace Constitution,” return to a more patriotic education system and restore the Emperor to his prewar position as the official head of state, critics of Japan’s current direction fear a return to something resembling the State Shinto of prewar Japan. Today, Shinto has only a small presence outside of Japan, with a smattering of shrines scattered across North America, Brazil, Hawaii and Europe. “The kami are where they are worshipped,” Wiltschko says. De Leeuw founded the Japanese Dutch Shinzen Foundation in Amsterdam in 1981. He was licensed through the Yamakage Shinto School in Shizuoka Prefecture, one of the approximately 1,000 shrines that opted to remain outside Jinja Honcho after 1945. Koichi Barrish opened the Tsubaki Grand Shrine of America in Granite Falls, Washington state, near Seattle, also in the 1980s. But, according to Dougill, Shinto’s presence abroad has withered since the heady bubble period, despite foreign curiosity.